Established in the beautiful Shenandoah Valley of Virginia in 1983, Camp Horizons is a diverse community of campers and staff members from across the United States and around the world working, playing, and learning together. Since our founding, we have been fully accredited by the American Camp Association (ACA), an organization that has been ensuring that American summer camps provide only the safest and highest caliber of programming for almost a century. Offering a variety of activities that challenge our campers to reach their full potential as individuals and team players, we are dedicated to making sure that campers experience their best summer ever at Camp Horizons and come to see their new camp friends as their new camp family. John’s hearty laugh, constant smile, and boundless energy have become trademarks of Camp Horizons since its founding in 1983. His contagious enthusiasm serves as the foundation for Camp Horizons and its philosophy of blending challenging and fun activities with a supportive community to create a home away from home where campers can feel secure. 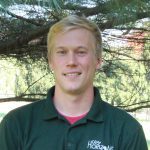 John was an Eagle Scout, a camp counselor, and traveled with Up With People before settling in Harrisonburg to pursue his life-long dream of operating a summer camp. 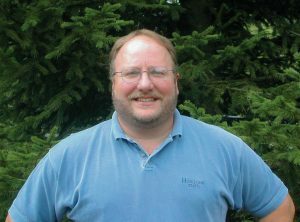 As a result of John’s business endeavors and achievements, he received the 2009 Entrepreneur of the Year Award from the Harrisonburg-Rockingham Chamber of Commerce. 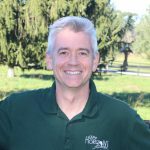 As a summer camp director, Martin brings a love of teaching, the performing arts, and the outdoors. As a young man his participation in both Semester at Sea and the international organization “Up with People” influenced him greatly and birthed a deep curiosity about the world. He also served as a Peace Corps Volunteer in Honduras, and has worked with numerous corporations and organizations in the areas of diversity and leadership. Hey y’all! My name is Liz and I am the Assistant Director here at Horizons. I started going to Camp Horizons when I was 7 years old and never left! I’m originally from Charlottesville, Virginia, but moved here in 2016 to live the camp life full-time. Before joining the team, I worked at a therapeutic boarding school in Charlottesville after receiving my Masters in Counselor Education from UVA. When I’m not at camp, you can find me around town with my fat cat Noodle or re-reading Harry Potter for the millionth time! Camp is my absolute favorite place in the world, and what it has given to me, and thousands of other campers, is why I keep coming back! 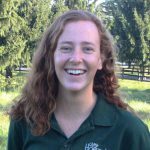 Hi, I’m Harriet and I am the Associate Director of the Leadership Camp during the summers and am the OLC Associate Director at our Horizons campus during the school year. 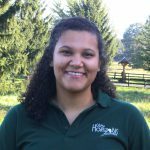 I began working at Camp Horizons in March of 2016 after earning my degree in Parks and Outdoor Recreation from George Mason University and working in the summer camp/outdoor recreation industry for 7 years. I love working at camp the most when I get to see campers making life longs friends and trying new activities that push themselves outside of their comfort zone. My favorite parts of summer camp are all the bonds that are formed, random dance parties, and swimming in the lake! When I’m not working, you can find me exploring a cave or hanging out with my miniature goat named Sid! Hi! 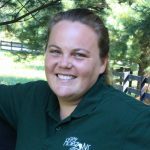 I’m Jenny, and I’m the Equestrian Director here at Horizons. Born and raised in the Shenandoah Valley, I have been around horses in some capacity since I was 5. After spending a few summers as part of the Equestrian Staff, I became the Director in 2016 and have absolutely loved it! I have experience in several different disciplines such as hunter/jumpers, dressage, and hunter paces. I absolutely love the unique teaching experience that horseback riding instruction brings, and love coming up with creative ways to help campers learn how to ride and care for horses. Hello everyone, my name is Trey Smith! I am the Director of the Outdoor Learning Center. I came to Horizons after studying Organizational Communication and Environmental Studies at James Madison University. I love camp because it provides the opportunity for campers to try an activity and develop a passion. When I am not at work you can usually find me reading, riding a bike, or paddling a canoe. Hi there! I am Geneva, a Customer Service Representative at Camp Horizons. 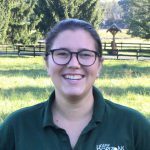 I made the move to Virginia from my (very beloved) hometown Pittsburgh, Pennsylvania in August of 2018 after working in the camping industry intermittently since I started as a counselor in 2010. Throughout college at Carnegie Mellon University I worked in several people-facing and event management positions that ignited my interest in customer service, but could never quite kick the camp bug that had me wanting to get back outdoors acting goofy. I love working with others and seeing the hard individual work of a whole lot of people come together, which makes camp customer service the perfect place for me. Other than chatting to parents about camp and logistics, you can catch me talking about music, theatre, or books to anyone who will listen.